No financial loss will be caused to the government on account of the Central Bank Bond issue since the government will recover the Rs 9.2 billion involved from Perpetual Treasures Ltd. according to the procedure recommended by the Presidential Commission. 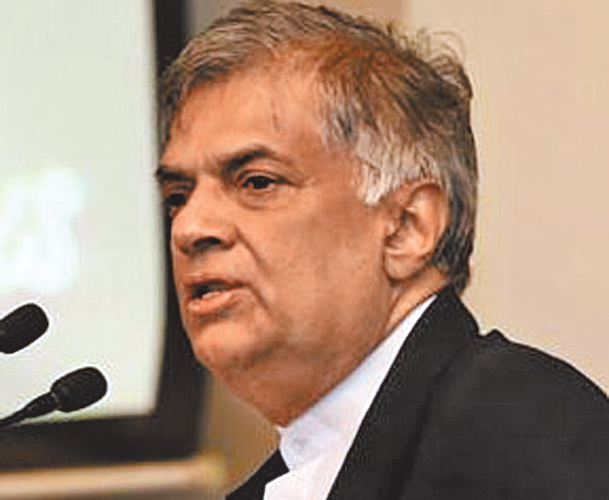 The Central Bank functioning under the Ministry of National Policy has already blocked and retained a fund of Rs 12 billion belonging to the Perpetual Treasures Ltd from which this money could be obtained Prime Minister Ranil Wickremesinghe said in a special address to the nation broadcast over the Electronic media last night. The Prime Minister said, we came to power on a mandate to eradicate bribery and corruption. We never tried to sweep it under the carpet”. Within two weeks we appointed a committee to investigate the allegation. Continuing the Prime Minister said in the past the President of the committee on Public Enterprises (COPE) was a member of the government. But the Presidents post in COPE was given to an opposition member for the first time in the present Parliament. COPE investigated the issuing of Central Bank bonds and tabled its report in Parliament which debated it. This report was sent to the Attorney General on October 31, 2016 for necessary action. COPE had recommended further investigations about it specially about Perpetual Treasures Ltd. Accordingly the President after discussions with me (the Prime Minister) appointed a Presidential Commission to probe it. We too assisted the Commission in its investigations. Ministers in the government and I personally appeared before the Commission. In Sri Lanka control of finance belonged to Parliament. But Parliament had forgotten this power vested in it. It is to stabilise Parliamentary control over finance that we entrusted this responsibility to COPE and Parliament. That responsibility cannot be taken away. We saw the Bond issue as an instance where Parliament exhibited its power over financial control properly. This was the best example which showed that the government was acting in a transparent manner. The Commission report had stated that Perpetual Treasures Ltd had earned unconscionable profits amounting Rs 9.2 billion from the issuing of these bonds. This can be recovered from the funds amounting to Rs 12 billion belonging to Perpetual Treasures Ltd retained by the Central Bank. If any group of officials are found guilty of this fraud legal action will be taken against them too. The Prime Minister said, “we rendered our maximum support to conduct investigations from the time the allegation was made against the issuing of Bonds. Our Ministers resigned for breaching accepted traditions. The law took effect and the Courts took independent decisions without any outside interference or influence. Apart from this we have appointed a committee chaired by Minister Tilak Marapane to conduct investigations against any party member against whom any allegations had been made by the Bond report and recommend suitable action against them. We will take action in keeping with recommendations made by this committee. The Prime Minister said this is the normal UNP tradition. We will develop and rebuild the country in keeping with our party tradition and the ‘Yahapalanaya’ vision. We will rebuild the villages and usher in a better tomorrow for the whole country and nation. The Prime Minister said: “we will effect the change people expected on January 8 and create a better tomorrow for the whole country. But this cannot be realised overnight or within a day or two. We can consider the Bond Commission investigation as a beginning towards achieving this goal. We will pay equal attention to the past and present and march forward along the correct path by correcting our mistakes and fulfilling shortcomings. The actions taken upto date from the time the allegation was made against the Bond issue proved that we have made a proper beginning. We will not only probe acts of corruption and fraud of the past regime but also investigate and take suitable action against corruption and fraud allegations made in the present day too. Our objective is to ensure a better future for the country and nation. Our prime goal is to transform this country into a rich and economically strong country. Let us join hands and work towards achieving that goal. Let us overcome all challenges and create a powerful and strong Sri Lanka”.